Mix and match Clear Design stamps with woodblock stamps for endless variety. Punch out a large scallop from white cardstock and stamp the Screen Shadow image as a background with Soft Blossom Shadow Ink. Stamp the “You Mean So Much” message from the Great Flourishes Messages set twice in ArtPrint Brown ink. Add an Art Flower with a Sparkle Gem Small Blossom in the middle. Add some Pale Pink Gemstones. Cut a strip from a Peony Notecard (from the Blush set) and mount onto a strip cut from a Chocolate Notecard. Mount all onto a Kraft Notecard. Stamp the Flower Background image in ArtPrint Brown ink onto a Peony Notecard. Stamp the “Thank You” image from the Great Flourishes Messages set in brown ink onto a strip from a Baby Blue Notecard. Cut a zig-zag edge from a Kraft Notecard. Adhere all onto the Peony card. Add a scallop circle punched from a Chocolate Notecard. Add a circle punched from a Crimson Notecard to the center of the scallop circle with a Sparkle Gem Small Blossom in the center of that. Stamp the “You Are Special” message in ArtPrint Brown onto a beige tag. Stamp “You Mean So Much” on the edges. Mount onto a piece of a Chocolate Notecard. Stamp the Flower Background image onto a Kraft Notecard. Punch a hole and tie a ribbon through it. Adhere to the card. Add an Art Flower and a Card Button. Cut out a tag from white cardstock. Stamp the Screen Shadow background in ArtPrint Brown ink on the bottom. Stamp again without inking on top for a muted look. Punch out a scallop edge from a Kraft Notecard and adhere. Stamp words onto pieces from a Crimson Notecard. Trim and mount. Add an Art Flower and Pale Pink Gemsstones. Tie a ribbon and mount the tag to a Pink Notecard. Kraft Notecards will bring balance to many color palettes. 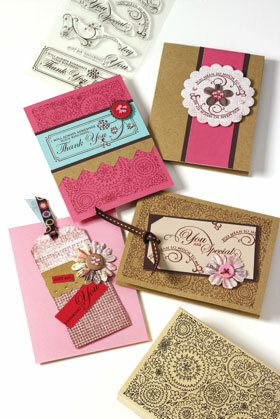 They compliment a variety of colors, and are perfect as either a card base or as an accent.